Their philanthropic contributions to cabaret in Melbourne were rightfully celebrated at the Green Room Awards this week – but that’s just one of many reasons to celebrate their impact on the performing arts. I was delighted to see Ron and Margaret Dobell honoured this week with a 2018 Green Room Award for Outstanding Contribution to Cabaret. It’s the first time the Green Rooms, established in 1982 and seen as Melbourne’s premier peer-presented performing arts industry awards, have recognised the huge part that philanthropy plays in supporting the wealth of cabaret activity in Melbourne. But that’s only one aspect of Ron and Margaret’s extraordinary support for and generosity towards the arts. They support a huge range of artistic individuals and organisations (including the Arts Centre Melbourne) but their chief philanthropic activity is actually focused on VCA Music Theatre, which I head. For the past ten years, Ron and Margaret have given substantial and thoughtfully-targeted financial support, chiefly but not exclusively through the Ron and Margaret Dobell Foundation Award, the scholarship component of which is valued at $25,000 – currently the richest prize for a music theatre performer in Australia. In the past year, they initiated a further two opportunities to reward students: the $3,000 Industry Award for the best audition across all three skill areas of Music Theatre performance by a third-year student, as judged by invited experts; and the opportunity for a graduate with a recognised talent for and interest in cabaret to undertake a substantial mentorship with burlesque cabaret performer Moira Finucane. As impressive as that is, their financial support of awards is only one element of their relationship with the VCA. They throw welcome and graduation parties, take third-years on theatre visits, support masterclasses and projects and, most importantly, are the two most supportive and positive audience members you’re ever likely to meet. Our students’ work always lifts when Ron and Marg are in the house. They become lasting friends with every student of our course who chooses to stay in touch with them. They follow the careers of every graduate and meet with endless numbers of ex-students for coffee to hear about their aspirations and projects. 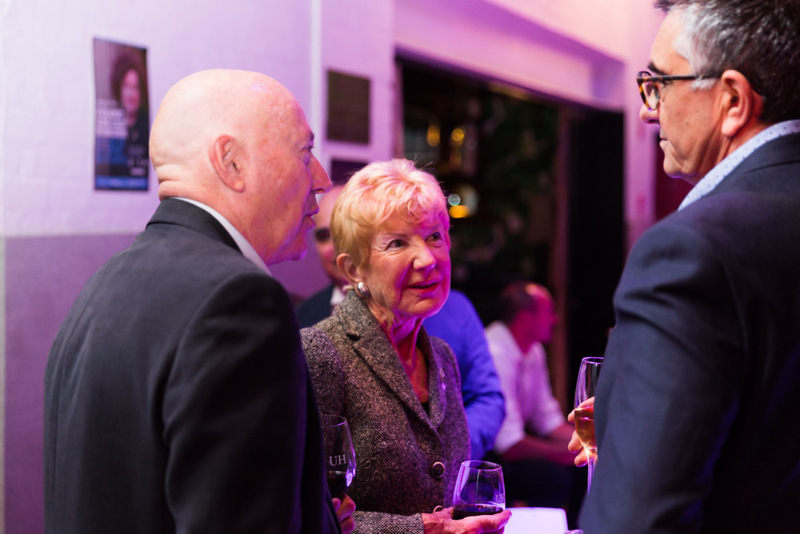 Ron and Margaret Dobell in discussion with VCA Director Professor Jon Cattapan (right of image) at the VCA’s 2017 Music Theatre fundraiser. By Drew Echberg. They have been an incredible support to me and my staff in all of our efforts to build and develop the excellent training we now offer music theatre performers. I count them as treasured personal friends. Two of the most inspirational, warm, loving and joyous people I have ever met in the arts, Ron and Marg are central to everything that’s good about VCA Music Theatre. As quiet givers who don’t seek public recognition, it’s wonderful to see them nonetheless honoured at the Green Rooms. “After years as enthusiastic audience members of music theatre, nothing could have given our lives greater fulfilment than being able to contribute to the education of the wonderfully talented students at the VCA and, as a consequence, to the continuation of the fine tradition of the performing arts in Victoria”. Find out more about Music Theatre at the Victorian College of the Arts. Sign up for the Faculty of Fine Arts and Music’s free monthly newsletter. 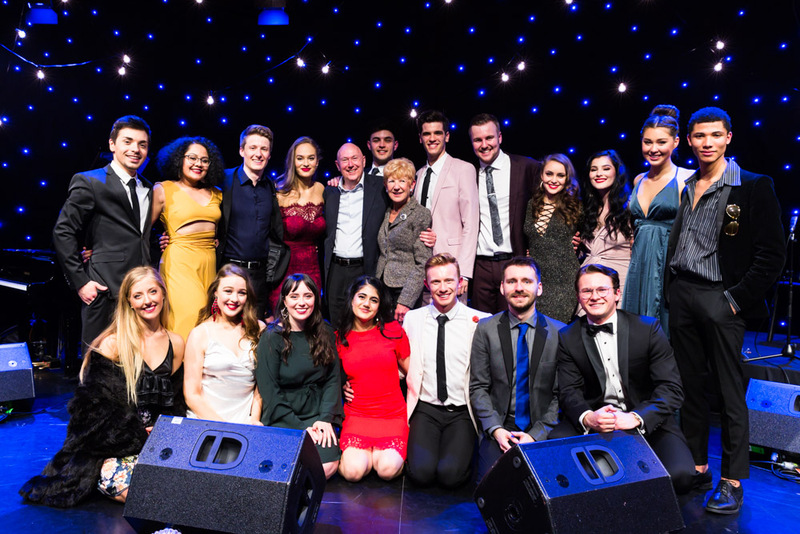 Banner image: Ron and Margaret Dobell, centre stage, with the VCA’s Music Theatre students in 2017. By Drew Echberg.